Classic suburban dinner table recipes from the women in my life made vegan. Awww chicken wings. I have to say, as much as I love being vegan, if I had a choice of what my last meal would be I can’t guarantee that it would be vegan. I know. I know. That is not great but dreams of real hot chicken wings, real cheesy mac & cheese and real flaky fish & chips sounds pretty good for my final bites. Although that day may never come, in the meantime I’ll try my best to feed that hunger with a little ingenuity. Cut the bamboo skewers just shorter than the scaloppini pieces so that both ends are blunt. Then, in a small bowl, make a paste with the 2 tbsp. of flour and a bit of water. Defrost the chicken scallopini pieces. Lay one skewer piece in the middle of each scallopini and fold the sides around it. This sounds a little gross but the chicken piece should be a bit mold-able so using your hands, shape the chicken around the skewer. I had a hard time sealing off the edges, so for that, spread a bit of the flour paste along the open edges to stick them together. Let them chill in the fridge for about 20 mins for the flour glue to bind. Preheat the oven the 400°F. While the oven is warming up, heat the canola oil in a large pot to about 350°F. Dredge each of the wings in a flour coating and drop them into the hot oil. Depending on how big your pot is, do a maximum of 3 at a time. Fry them until they are a light brown, about 3-5 mins. Remove each of the wings with tongs and place them on a paper towel lined plate. Once some of the oil has been soaked up, toss the wings in a shallow bowl filled with the buffalo sauce and place on a baking sheet. Bake the wings in the oven for about 15-20 minutes, until the sauce has gotten sticky and caramelized. In the meantime, make the blue cheese dressing. Mix all of the ingredients in a small food processor until smooth and creamy. The arame is more just for the look so if you don’t have any easily accessible, don’t worry about it. 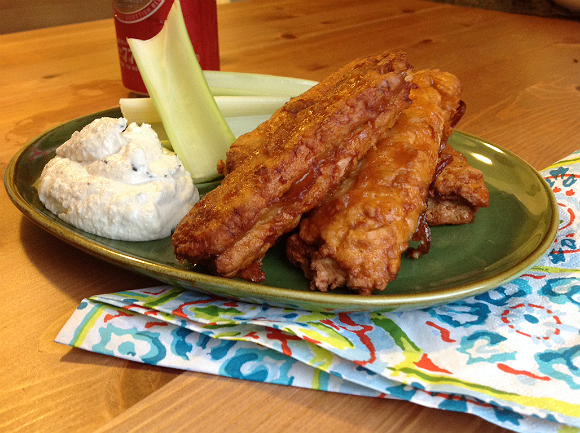 Serve the wings along with the dressing and a few stalks of celery. Don’t eat the sticks! Don’t forget you can follow The Antique Appetite on Twitter @antiqueappetite, friend me on Facebook AND subscribe to the blog by clicking the link on the right! Also I have a Pinterest page with links to some of my other favourite vegan recipes. I thought your comment was going to be about how that doesn’t count as vegan blue cheese dressing. haha Which is also valid. Vegans call any creamy dip anything.